Glaz Tech Industries provides bent tempered glass for architectural, commercial, and residential applications. Utilizing state of the art technology, Glaz-Tech Industries now offers bent or curved glass to accompany its diverse products & services. 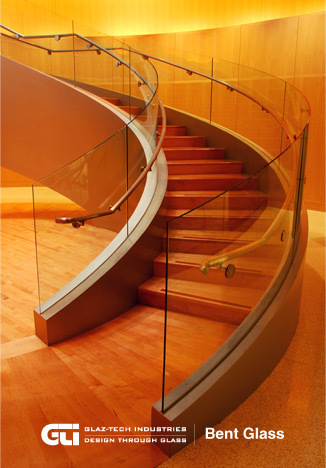 Bent glass is offered in a large variety of glass products, including clear, Low-E, tinted and reflective glass, to meet the desired design criteria and aesthetics. Bent glass provides versatility and elegance for any project that requires complex commercial or residential design applications. Max Glass Size : 141" x 82"
Min Glass Size : 31" x 20"
1/4" Glass Min Radius : 63"
3/8" Glass Min Radius : 70"
1/2" Glass Min Radius : 78"
3/4" Glass Min Radius : 98"
Inquire about an exclusive distribution in your area. Utilizing Freight Rate for the best possible shipping cost. Less than truck load "LTL" shipments are also avail. Available delivery in all 48 Continental States.